ANY GIVEN SATURDAY (USA) (Bay 2004-Stud 2008). 6 wins-2 at 2, Monmouth Haskell Invitational H., Gr.1. Sire of 561 rnrs, 400 wnrs, 19 SW, inc. Hoppertunity (Churchill Downs Clark H., Gr.1), Mongolian Saturday, Cristina's Journey, Hey Leroy, Tomas Gabriel, Dixie Indy, Casino Wizard, Carving, Dry Summer, Show Some Magic, Thumping, Brother Pat, Princess Arabella, Saturday Skies, Muggsamatic, Richies Party Girl, Fasnacloich, Winter Book, etc. He's a Given (g. by Any Given Saturday). 7 wins. See below. Captain Siderius. 7 wins from 1600m to 2400m, R286,025, 2d Griqualand Pinnacle S., 3d Griqualand J&B Met Pinnacle S., Pinnacle S.
Chappel Hill. Winner at 1400m, 2d Kenilworth Champagne Stakes Raceday H.
Around Not Across. 2 wins at 1000m, 1200m in South Africa. Make it Raine. 3 wins at 1000m, 1200m, R182,550, to 2016-17, Kenilworth Capetown Noir H., 2d Kenilworth Mrs English H., 3d Kenilworth Supabets H.
Anyday Anytime. 3 wins to 1200m, R200,175, to 2017-18, Vaal Soccer 6 H., 2d Vaal Racing Association H.
Red Rain. 2 wins-1 at 2-at 1000m, 1100m, A$77,047, 2d MRC The Lister H., 3d MRC Le Pine Funerals H., MRC (Mornington) Polytrack H., MVRC 17 Month Membership Premium H.
She's Red Hot. 2 wins. See above. Dizzy Rocking. 2 wins-1 at 2-at 1400m in Aust. True Flex. Winner at 1400m in Aust. HARLEM SHAKE (Warm White Night). 3 wins-1 at 2-from 800m to 2000m, R345,650, Kenilworth Final Fling S., Gr.3, 2d Kenilworth Victress S., Gr.3, Winter Oaks, L.
Our Dizzy Emblem. 3 wins at 1000m, 1200m, R223,605, Fairview Soccer 6 H., 2d Greyville Rugby 5 H.
Lucky Barb. 2 wins at 1000m in 2016-17 in South Africa. Eternal Sunshine. Winner at 1000m in South Africa. Flame of Hope. Winner at 1150m in South Africa. Majulah Superstar. 4 wins from 1250m to 1800m in HK. Meteor Master. 5 wins from 1200m to 1750m, A$104,683, MVRC Selection Steel H.
Meteor Mistress. 4 wins to 1200m, A$98,117, MRC CF Carrier H., 2d MRC Frank O'Brien H., Broadbridge H., 3d MRC Robert Hunter H., MVRC Members Equity Bank H. Producer. Meteor Miss. Winner at 2, VATC HIH Insurance 2YO P.
Stratospheric. Winner at 2 in Aust. Good Striker. 3 wins at 1000m, 1200m, Singapore TC Big Easy H., Novice H., 3d Singapore TC Better Than Ever H., Star River Windsor Arch Cup, Graduation H.
Our Dizzy Heights (Sir Tristram). Winner. See above. Lordnor (Lord Revenir). 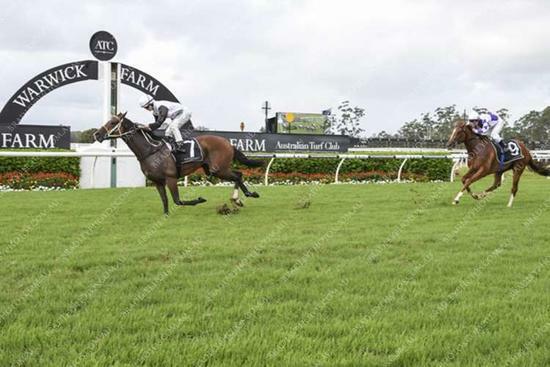 3 wins from 1600m to 2200m, A$137,413, BTC QBBS & Winners Club H., 2d Queensland Cup, L, BTC Black Toyota Dalby H., Moraitis Fresh Produce H., NSW Tatt's RC Cabravale Diggers Past Members H., BTC Citytrian H., Biscay H., Prunda H., Members H., Qld Tatt's RC Franklins Fresh H., QTC Primus Mobiles H., Sky Ace H.-twice, Harry Plant H., Seals Livestock Services H., Bengalla Lad H., 3d Rockhampton Cup, L, BTC Western 4x4 Toombul Road H., Hardy Brothers Jewellers H., Wattyl H., Qld Tatt's RC Tattersall's H., QTC W Glasson H., Ascot Bar H., Tipperary H.
Race Record: 45 Starts 7-5-4 A$201,105. 7 wins to 1400m, A$201,105, to 2016-17, ATC More Than Just Winning H., Schweppes H., TAB Rewards H., 2d ATC Tooheys New Evening Star H., Theraces H., Alm H., 3d ATC Tab.com.au H., Pro-Ride H., McGrath Estate Agents H.